Magdy Abdel-Mota'al, M.D. Research Fellow. This child was 6-1/2 months old, when she was referred to the Alfred I. duPont Institute for a second opinion on her left proximal femoral focal deficiency and fibular hemimelia. Considerable shortening of the left lower extremity was noted with abnormal musculature about the hip and a marked laxity about the knee joint. The left foot showed valgus deformity and missed toe. 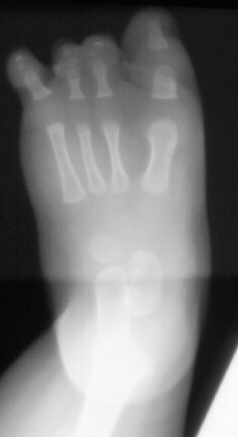 X-ray of the left lower extremity showed PFFD, type A or B ( Aitken's classification) , congenital fibular hemimelia (type II (Achterman & Kalamchi classification )) and an absent lateral ray of the foot . The developing human embryo first shows evidence of limb buds at the 5 millimeter crown-rump stage.As the apical mesoderm proliferates the limb is laid down in a proximo-distal fashion to be complete at the 12 millimeter stage. Elements of the ileum and proximal femur develop from a common cartilaginous anlage, with subsequent cleft formation to create a joint cavity. This means that if an acetabulum is seen in radiograph at any time in the first year of life a femoral head and neck will be present also, even if not evident in the radiograph. Numerous agents including irradiation, anoxia, ischemia, mechanical or thermal injury, bacterial toxins, viral infection, chemicals and hormones have been postulated as a cause. However, only the drug thalidomide has been showed to be a definitive cause. When it was taken 4 to 6 weeks after conception, during the period of limb bud formation and differentiation, major limb deformities were produced. - The involved leg is not as short as in true PFFD; the foot is at approximately mid tibial level in relation to the uninvolved limb. -The leg is flexed, abducted, and laterally rotated. -Anteroposterior laxity of the knee with valgus deformity. -X ray: the femoral head and neck are in varus and in retroversion. -In this group the knee and the hip can be made functional and, in some patients at least, leg equalization is possible. -A tenuous cartilaginous bridge exists between the proximal shaft and the femoral head. -The leg is held in abduction and external rotation. -Flexion contracture of both hip and knee. -Surgical procedures are design to facilitate the fitting of the prosthesis. -The femur is short with coxa vara and lateral bowing of its upper third. -There is always adequate acetabulum that contains the femoral head. -At the Subtrochanteric region a pseudoarthrosis develops. -At the skeletal maturity, ossification of the pseudoarthrosis will take place in moat cases, but the varus angulation may be very severe. -The ossification of the capital femoral epiphysis is delayed and the acetabulum is mildly dysplastic. --The upper end of the femoral shaft lies above the femoral head. -The junction between the femoral head and shaft is by defective cartilage that fail to ossify at skeletal maturity. -The acetabulum is markedly dysplastic and the femoral head never ossify. -The femoral shaft is very short and its upper end tapers sharply to a point. -The hip is very unstable. -Both acetabulum and femoral head are absent. -The femur is represented by the femoral condyles. Shortening of the tibia and fibula. The patella may be absent or small and high riding. The patellofemoral joint may be laterally subluxated or dislocated. Flexion deformity of the knee genu valgum. Foot malformation; mild hypoplasia, absence of rays, tarsal coalition, talipes equino varus, or vertical talus. Contralateral lower limb and upper limb deformities. The degree of lower limb disparity varies, depending on the type of PFFD. There are flexion, abduction, and lateral rotation contractures of the involved hip and flexion contracture of the knee. The Quadriceps Femoris is often hypoplastic with high riding patella. The Sartorius muscle is strong and contracts on attempting knee extention. When the infant begins to stand, the contralateral knee is held in flexion in an attempt to compensate for the marked limb length discrepancy. In mild cases the patient walks with a short leg limp but in severe cases he may be not able to ambulate unless an extenuation orthosis is provided. Aim: To provide optimal function, improve appearance and consider the psychological aspects. Evaluation: The two essential factors to be considered in determining any treatment plan for PFFD are the predicted length of the femur at maturity and pelvic-femoral stability. The percentage of growth inhibition in the involved femur compared to the contralateral side was found to be constant in unilateral cases. The percentage of growth inhibition is calculated by the difference between the normal and abnormal lengths divided by the normal length and multiplied by 100. The anticipated normal limb segment length is determined by using serial scanograms and plotting the limb length on the Green-Anderson graph according to skeletal age. The anticipated normal limb length is multiplied by the percentage of growth inhibition, and the length of the involved limb segment at skeletal maturity can be determined. 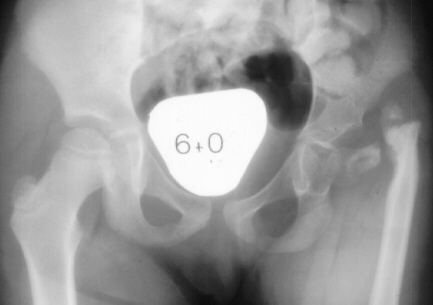 The acetabular index, shelf index, acetabular radiodensity, and acetabular dysplasia are used to predict ultimate pelvic-femoral stability at early age. Class (I): Patients have greater than 60% of the predicted femoral length, evidence of pelvic-femoral stability, less than 17 cm of projected extremity shortening, and the presence of a stable planta-grade foot. Class(II):Patients have less than 60% of the predicted femoral length or greater than 17 cm predicted extremity shortening. If the neck -shaft angle is less than 110 degrees, valgus osteotomy can be done. The patient will require one more femoral lengthening and-or contralateral epiphysiodesis. With non-salvageable foot, objective evidence of pelvic-femoral instability, a predicted total limb discrepancy of greater than 17 cm should have ablation surgery. With evidence of potential pelvic-femoral stability, a serviceable foot, and less than 17 cm of combined tibial and femoral discrepancy, the decision to lengthen the tibia must based on projected tibial length; if the discrepancy is greater than 7 cm, tibia lengthening should be done if it is less than 7 cm contralateral growth arrest is considered. After equalization of the tibial length, femoral inequality must dealt with. However for class(I) early partial ablation may be the treatment of the choice. The parents should understand the magnitude of the operative procedures for length equalization, the potential risk, including amputation at less desirable level, and the lengthened extremity will still not be normal. Prosthesis should be fitted within one month of the surgery. Knee fusion at the age of 3-4 years. Construction of an acetabulum by Chairi's medial displacement iliac osteotomy will provide a roof to which the distal femur is fused, thereby converting the knee to function as a hip. This operation can be done for type D PFFD. Position sense is maintained by preserving the foot. Greater stability and better control of gait in the swing phase. Ability to flex the knee. Ankle joint with normal range of motion and muscle power. A predicted lower limb inequality that put the ankle at the level of the opposite normal knee. The gait, despite being of the wadling type, is very effective. The main problem is cosmesis. Considerable height can be added by using bilateral extention prosthesis with an augmentation segment below the feet. However, increasing their stature is of no value if they lose mobility. Inability to make the foot plantargrade. For Aitken type (A); AI less than 35, neck-shaft angle less than 110 degrees, and shelf index of greater than 0.5. Centeralization of the foot in patients with fibular hemimelia and a non-plantar grade valgus foot. Aitken, G.T. 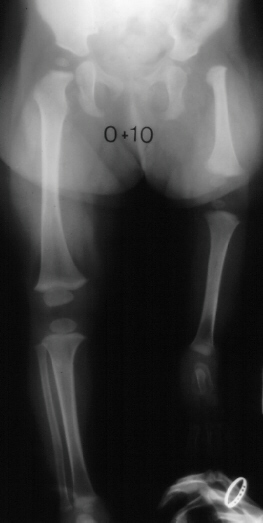 : Congenital short femur with fibular hemimelia. JBJS: 56 -A: 1306, 1974. Frantz., C.H., and O'Rahilly, R.: Congenital limb deficiencies. JBJS: 43-A: 1202, 1961. Gillespie, R.,and Torode, I.P. : Classification and management of congenital abnormality of the femur.JBJS. : 65-B: 557, 1983. Hall, C.B., Brooks, M. B. , and Dennis, J. F. : Congenital skeletal deficiencies of the extremities: classification and fundamental of treatment. JAMA, 181: 590, 1962. King R.E., : Some concepts of proximal femoral focal deficiency. JBJS: 49-A: 1470, 1967. Koman, L.A., Meyer, L.C., and Warren, F. H. : Proximal femoral focal deficiency: natural history and treatment. Clin. Orthop., 162: 135, 1982. Moseley, C.F. : A straight -line graph for leg length discrepancies. JBJS: 59-A: 174, 1977. Panting, A.L. , and Williams P. F.: Proximal femoral focal deficiency. JBJS 60-B: 73, 1959.